The mechanisms responsible for the generation of a mature B1 and B2 cell compartment are still poorly understood. In this study, we demonstrated that absence of Dickkopf-3 (DKK3) led to changes in the composition of the B cell compartment, which were due to an altered development and maintenance program of B cells. Development of B2 cells was impaired at the pre- and immature B cell stage, resulting in decreased numbers of follicular B cells in adult DKK3-deficient mice. Furthermore, DKK3 limited B1 cell self-maintenance in the periphery, by decreasing the survival and proliferation behavior of B1 cells. DKK3 may act via the BCR signaling pathway, as Ca2+ influx upon BCR stimulation was increased and SiglecG, a molecule shown to inhibit Calcium signaling, was downregulated in the absence of DKK3. DKK3-deficient mice exhibited altered Ab responses and an increased secretion of the cytokine IL-10. Additionally, DKK3 limited autoimmunity in a model of systemic lupus erythematosus. In summary, we identified DKK3 as a novel modulator interfering with B cell fate as well as the maintenance program of B cells, leading to changes in B cell immune responses. B cells are subdivided into B1 and B2 cells. The names were chosen due to the observation that B1 cells develop earlier than B2 cells during ontogeny (1, 2). B1 and B2 cells are found in different anatomical locations, have different surface markers, and fulfill their functions in different types of immune responses (3). B2 cells are generally responsible for the adaptive Ab response, whereas B1 cells serve as a first line of defense as part of the innate immune system, by secreting most of natural IgM (4, 5). B1 cells are commonly subdivided into B1a and B1b B cells according to the expression of CD5, which is expressed on B1a cells, but not on B1b cells. Both B1 cell subsets are present at a high proportion of 30–70% of the total B cells, depending on the mouse strain, in the pleural and peritoneal cavity (3). B2 cells are subdivided into follicular (FO) and marginal zone (MZ) B cells. FO B cells present the majority of B cells in the body, with >95% of B cells in lymph nodes (LN) and >70% of B cells in the spleen (3). MZ B cells are only found in the MZ of the spleen and have a distinct function in comparison with FO B cells. Similar to B1 cells, MZ B cells respond fast to blood-borne pathogens with T cell–independent Ab production (6). B2 cells develop mainly in the bone marrow (BM) during the whole lifespan of a mouse, whereas the majority of B1 cells originate from fetal liver precursors before birth (7). B1 cells increase poorly in adult BM, especially B1a cells (8, 9). The B1 cell population in the periphery is sustained by self-renewal (1). Although it is clear that B1 and B2 cells develop at different times and locations in ontogeny, it is still discussed as to whether these cells belong to different lineages, or whether the respective phenotypes are acquired in dependence BCR specificity. For example, lack of expression of the enzyme Tdt in fetal liver (10, 11) leads to the generation of a different BCR set. Furthermore, it was demonstrated that BCR strength is important to determine the fate of a B cell (12, 13). In addition, it was shown that B cells expressing the typical B1 cell markers such as CD5 can be acquired from BM precursors if they express a transgenic BCR, normally carried by B1 cells (14–17). In contrast, a progenitor population was found in the BM and fetal liver, which includes progenitors whose developmental potential is restricted to B1 cells, but not B2 cells, supporting the lineage hypothesis (18). In any case, the factors that control B2 versus B1 cell development are still unknown. Dickkopf-3 (DKK3) is a secreted protein belonging to the Dickkopf family. This protein family is known to influence Wnt signaling (19). Whether and how DKK3 is involved in Wnt signaling is still controversial (20–25). DKK3 is expressed in the eye, heart, liver, hair follicle, uterus, embryo, placenta, and pancreatic β islet cells (21, 26). It is also present in the blood (27). We have shown previously that DKK3 could limit CD8 T cell reactivity (28). Therefore, we were interested in whether DKK3 could also affect B cell function. Increased IgM serum levels observed in DKK3-deficient (Dkk3−/−) mice suggested a modulatory role of DKK3 in B cell biology (29). By comparing DKK3-sufficient and -deficient mice, we show that DKK3 influences the development and maintenance program of B cells, thereby altering B cell functions, such as cytokine secretion and Ab production. In an autoimmune setting of systemic lupus erythematosus (SLE), blockage of DKK3 aggravates disease, demonstrating the importance of DKK3 as a regulatory protein in a B cell–mediated autoimmune disease. C57BL/6 (wild-type [wt]), Dkk3−/− (C57BL/6 background), wt.Rag2−/− (C57BL/6 background), Dkk3−/− Rag2−/− (C57BL/6 background), CD45.1, C57BL/6, Dkk3−/− RA/EG+/− (30) (C57BL/6 background), and MRL/LPR mice were bred at the central animal facility of the German Cancer Research Center (Heidelberg, Germany). All animals were held under specific pathogen-free conditions. Experiments were approved by the Regierungspräsidium Karlsruhe and conducted according to governmental and institutional guidelines. Single-cell suspensions of BM, spleen, lymph nodes, or peritoneal cavity lavage were incubated 15 min at 4°C with anti-CD16/CD32 Fc-receptor block and washed, followed by 30 min at 4°C incubation with varying combinations of the following Abs: anti-CD19 (BioLegend), anti-B220 (BD Biosciences), anti-CD5 (BD Biosciences), anti-CD43 (BD Biosciences), anti-CD23 (BioLegend), anti-CD3 (BD Biosciences), anti-λ (BD Biosciences), anti-κ (BD Biosciences), anti-CD93 (BioLegend), anti-CD25 (BD Biosciences), anti–c-kit (BD Biosciences), anti-CD21/35 (BD Biosciences), anti–IL-10 (BD Biosciences), and anti–SiglecG-biotin (31). Staining was performed in Dulbecco’s PBS (dPBS) containing 2% FCS and 0.1% sodium azide. Data acquisition was carried out with an eight-color flow cytometer (Canto II; BD Biosciences) and analyzed with FlowJo (Tree Star). To generate BM chimeras, 2 × 106 BM cells from wt mice (CD45.1+) and Dkk3−/− RA/EG+/− mice (eGFP+) were mixed at a ratio of 1:1 and transferred i.v. into either wt.Rag2−/− or Dkk3−/−Rag2−/− mice. Donor BM cells had been treated with anti–CD4-biotin, anti–CD8-biotin, anti–B220-biotin, and anti–CD19-biotin (all from BioLegend) and depleted negatively with streptavidin beads (Dynal). Five weeks after transfer, cells from the BM, spleen, and peritoneal cavity (PerC) were analyzed by FACS. To generate B1 cell chimeras, B1 cells were purified from PerC of wt (CD45.1) and Dkk3−/− (CD45.2) mice by anti-CD19 microbeads (Miltenyi Biotec), followed by a subsequent treatment with anti–CD23-biotin (BioLegend) and streptavidin beads to deplete CD23+ cells. Cells were mixed at a ratio of 1:1, and 1 × 106 B1 cells were transferred i.v. into either wt.Rag2−/− or Dkk3−/− Rag2−/− mice. Four weeks after transfer, cells from spleen and PerC were analyzed by FACS. Eight- to 12-wk-old mice were provided drinking water containing 0.8 mg/ml BrdU (Sigma-Aldrich) and 1% (w/v) sucrose (Roth). After 9 d, cells were isolated and stained with surface Abs and the BrdU Flow Kit (BD Pharmingen), according to manufacturer’s instructions. Samples were measured by FACS. Splenocytes and PerC cells were loaded with Indo-1 (Invitrogen) and stained extracellularly with CD5-PE (BioLegend), CD43-allophycocyanin (BD Biosciences), CD23 PE-Cy7 (BioLegend), B220 allophycocyanin-Cy7 (BD Biosciences), and CD19-FITC (BioLegend). Calcium influx was assessed 1 min before until 5 min after stimulation with F(ab′)2 anti-IgM (Dianova) in gated B cell population on a LSRII (BD Biosciences). Raw data files were transferred to FlowJo software, and mean of calcium influx (ratio of Ca2+-unbound Indo-1 to Ca2+-bound Indo-1) is presented in a comparative overlay analysis. Extracellular Ab staining had no influence on calcium measurements, as assessed by unstained cells. B1 cells from PerC were purified by anti-CD19 microbeads (Miltenyi Biotec), followed by a subsequent treatment with anti–CD23-biotin (BioLegend) and streptavidin beads to deplete CD23+ cells. B2 cells from spleen were purified by anti-CD19 microbeads. B1 and B2 cells were plated to 96-well plates in triplicates for each analysis time point. To assess apoptosis, cells from cultures were stained extracellular for surface markers. Then cells were fixed 10 min at room temperature with 2% (w/v) paraformaldehyde, washed with dPBS, permeabilized with Perm/Wash solution (BD Biosciences), and followed by staining with Hoechst in Perm/Wash solution for 30 min on ice. Cells were washed, resuspended in dPBS containing 2% FCS and 0.1% sodium azide, and measured with the FACS Canto II. C57BL/6N and C57BL/6N Dkk3−/− mice were injected s.c. with 50 μg 2,4,6,trinitrophenol (TNP)-BSA or 100 μg phosphorylcholine–keyhole limpet hemocyanin in CFA or treated i.p. with 50 μg TNP-Ficoll or 4 mg/g weight LPS in PBS. Serum was isolated before immunization, at days 7, 14, and 21, and analyzed by ELISA for concentration of Ag-specific or total Ab titers of relevant isotypes. Ag-specific Ig detection was carried out according to standard procedures. Costar polystyrene microplates (Sigma-Aldrich) were coated with 10 μg/ml respective Ags, and samples were incubated at room temperature for 2 h. HRP-conjugated Abs against the respective isotypes were added, and the following color reactions were measured at 492 nm at the ELISA reader (Victor 1420; PerkinElmer). Five-week-old MRL/LPR mice were treated with 0.7 mg/mouse anti–mDKK3-4.22 Ab or MOPC21 isotype control i.p. twice per week for 6 wk. Afterward, mice were analyzed for symptoms of SLE. Results are shown as mean ± SEM. For statistical analysis, the Student t test was applied to obtain p values. The p values <0.05 were considered significant. To analyze whether DKK3 affects B cell composition in general, we compared different B cell subpopulations in wild-type (wt) and DKK3-deficient mice. 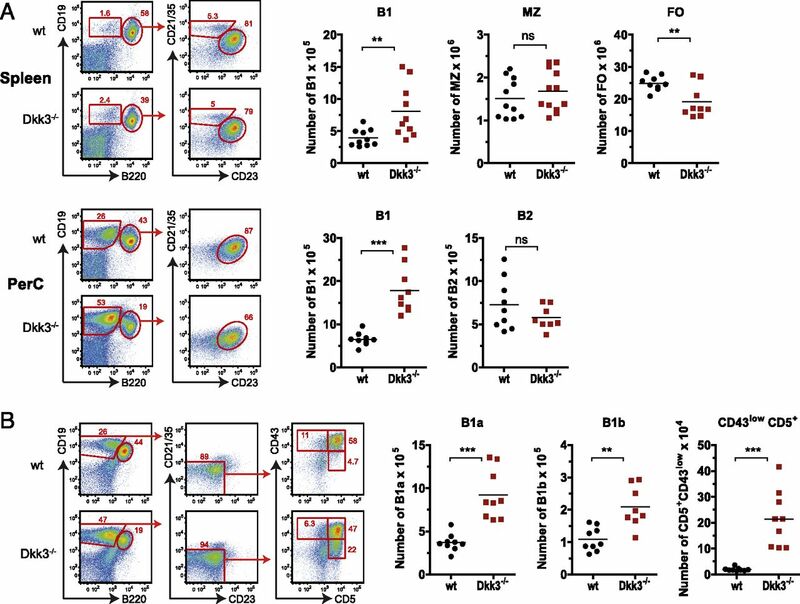 Decreased numbers of FO B cells were found in the spleen and mesenchymal LN of adult (8- to 12-wk-old) and younger (2- and 4-wk-old) Dkk3−/− mice (Fig. 1A, Supplemental Fig. 1). MZ B cells were present at equal numbers in wt and Dkk3−/− mice. In contrast, the B1 cell population was increased in spleen, peripheral lymph node (inguinal and axillary), and PerC of adult mice (Fig. 1A, Supplemental Fig. 1). We found that both B1a and B1b cells were increased in Dkk3−/− adult mice (Fig. 1B). Interestingly, a third population being CD5+ but CD43low was visible in Dkk3−/− mice, which was not present in wt animals (Fig. 1B). DKK3-deficient mice exhibit decreased numbers of follicular B cells and increased numbers of B1 cells. FACS analysis of B cells from spleen and PerC of 8- to 12-wk-old wt and Dkk3−/− mice. (A) Gating of B1 (CD19+B220int. ), B2 (CD19+B220high), follicular (FO/CD19+B220highCD23+CD21/35int. ), or marginal zone (MZ/CD19+B220highCD23int. CD21/35high) B cells from splenic leukocytes and absolute numbers of these subsets in individual mice. (B) Gating of different B1 cell subsets from PerC leukocytes and absolute numbers of these subsets. B1 cells were gated as CD19+B220int.CD23−CD21/35−, B1a cells as CD43+CD5+, B1b cells as CD43+CD5−, and a third B1 population being CD43lowCD5+ was also analyzed. Summary data of three independent experiments. One dot represents cell numbers of one mouse. Mean is indicated for each group. Groups were compared using Student t test. **p < 0.005, ***p < 0.0005. ns, not significant. To analyze whether the observed B cell phenotype is due to an altered B cell developmental program, we analyzed the B cell compartment at different developmental stages. We started to analyze neonatal mice, as at this early time B2 cell development is rising and B1 cell development is still taking place. The total B cell number was decreased in spleen and PerC of Dkk3−/− neonatal mice (Fig. 2A, Supplemental Fig. 2A). In the spleen, this was due to a reduction of the transitional (immature) B cell population and other progenitor B cells (IgM− CD93+ B cells). Interestingly, at this time point the mature FO and the B1 populations were not affected by DKK3, indicating that DKK3 acts on earlier B cell stages (Fig. 2A). Also, in the PerC, the mature B1 and B2 populations had similar numbers compared with wt mice (Supplemental Fig. 2A). The development of B2 cells is impaired in the absence of DKK3. (A) FACS analysis of B cells isolated from spleen of neonatal C57BL/6 (wt) and Dkk3−/− mice day 5 after birth. All analyzed B cell subsets were B220+CD19+. Progenitors were CD93+IgM−; T1 were CD93+IgM+CD23−; T2 + T3 were CD93+IgM++CD23+; FO were CD93−IgM+CD23+; MZ were CD93−IgM+CD23−CD21+; and B1 cells were CD93−IgM+CD23−CD21−CD5+. (B) FACS analysis of B cells isolated from BM of 4- and 8- to 12-wk-old C57BL/6 (wt) and Dkk3−/− mice. All analyzed B cell subsets were B220+CD19+. Prepro + Pro B cells were CD93+CD25−CD43+/−c-kit+/−, pre-B cells were CD93+IgM−CD25+, immature B cells were CD93+IgM++, B2 B cells were CD93−IgM+CD23+, and B1 cells were CD93−IgM+CD23−CD43+CD5+. (C) Expression of DKK3 in B cells of wt and Dkk3−/− mice and wt.Rag2−/− and Dkk3−/−Rag2−/− mice assessed by RT-PCR. Mean and SEM of five independent samples. (D) FACS analysis of mixed BM chimeras generated by injection of T and B cell–depleted BM cells from wt mice (CD45.1+) and Dkk3−/− RA/EG+/− mice (eGFP+) that were mixed at a ratio of 1:1 and transferred to either wt.Rag2−/− or Dkk3−/− Rag2−/− mice. Five weeks after transfer, mature B2 cells (B220+CD19+ IgM+CD93−CD23+) in spleen and immature B cells (B220+CD19+ IgM++CD93+) in BM were analyzed. Summary data of three independent experiments are shown in (A), (B), and (D). One dot represents cell numbers of one mouse. Mean is indicated for each group. Groups were compared using Student t test. **p < 0.005, ***p < 0.0005. ns, not significant. To investigate all stages of B cell development, BM of 2 wk (data not shown), 4 wk, and adult mice was analyzed (Fig. 2B). Pre- and immature B cells were drastically reduced in Dkk3−/− BM, whereas prepro+ pro-B cells were unaltered. Also, in this study, the B1 population was not affected by DKK3 deficiency. The mature B2 population in the BM of Dkk3−/− mice was only reduced in 8- to 12-wk-old mice, but not yet in 4-wk-old mice. This observation suggests that the developmental step from the immature to the mature B cell seems not to be influenced by DKK3 (Fig. 2B). To confirm that DKK3 impact starts at the pre-B cell step, in which the pre-BCR is expressed upon H chain recombination, RAG2-deficient (Rag2−/−) mice were analyzed, which are not able to express any form of pre-BCR or BCR. In these mice, no difference in B cell progenitor numbers was found (Supplemental Fig. 2B), confirming that B cell development is only impaired after BCR recombination started. 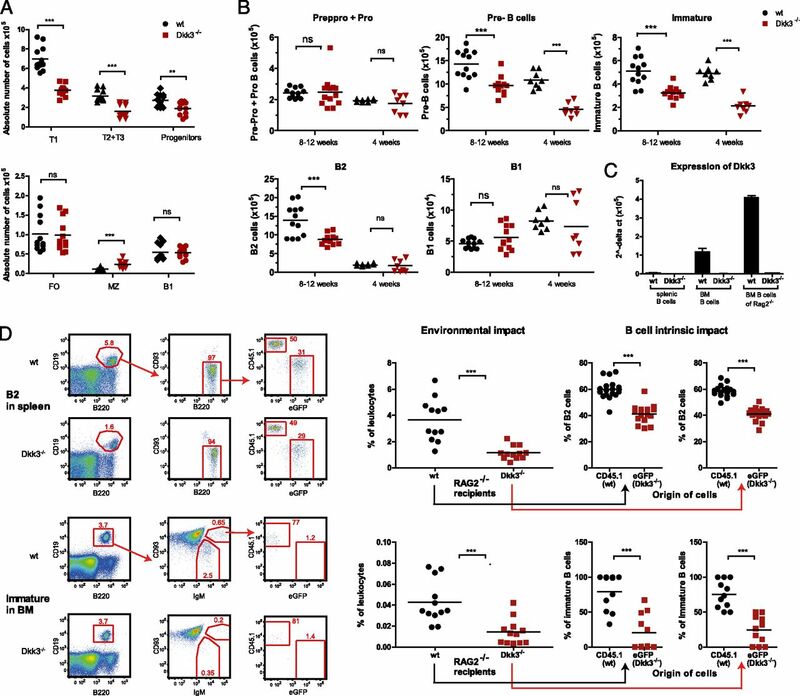 DKK3 expression was found at low levels in B cells of the BM and to a higher extent in progenitor B cells of Rag2−/− mice, but not in mature B cells of the spleen (Fig. 2C). To analyze whether the intrinsic, autochthonous DKK3 expression is responsible or contributes to B cell development or whether only environmental, non-B cell–derived DKK3 plays a role, BM cells of wt (CD45.1) and Dkk3−/− (eGFP+) hosts depleted of all B and T cells were mixed in a 1:1 ratio and transferred into RAG2−/− (CD45.2) recipients that were either wt or Dkk3−/−. After 5 wk, recipient mice were analyzed. B cell development was strongly impaired in Dkk3−/− recipients, demonstrating that environmental DKK3 is important for B cell development. 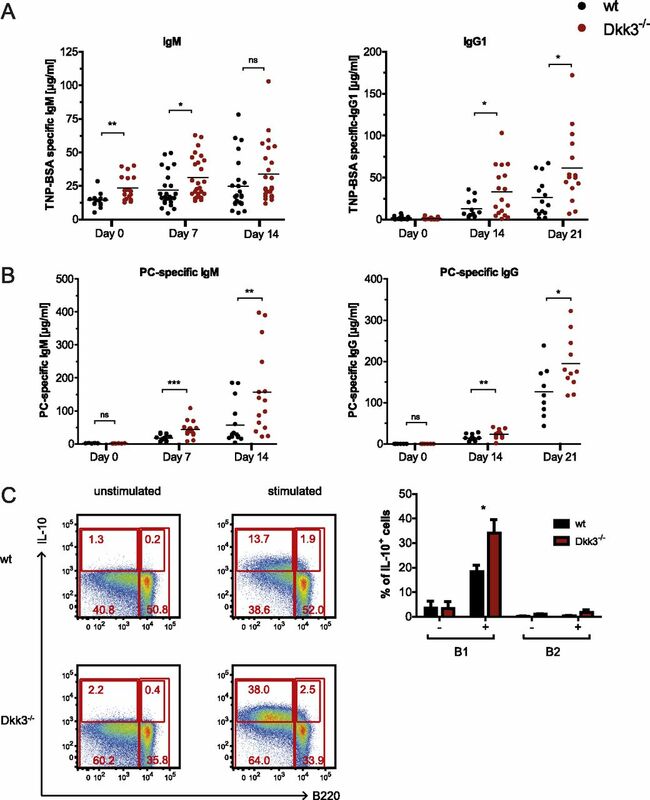 Interestingly, the B cell origin also played an important role, as CD45.1+ cells coming from wt mice developed stronger into mature and immature B cells in comparison with eGFP+ isolated from Dkk3−/− mice (Fig. 2C). This was observed in wt and Dkk3−/− recipients equally, demonstrating the importance of the intrinsic DKK3 expression, as environmental DKK3 is not able to cover this effect. In Dkk3−/− mice, the only cells capable of expressing DKK3 are the transferred progenitor cells. As control populations, we analyzed T and B1 cells (Supplemental Fig. 2C). T cells were found at higher numbers in Dkk3−/− recipients, but the origin did not play a role. For B1 cell development, lack of DKK3 in transferred B cells, reflecting the B cell origin, also did not play a role in wt recipients or led to even higher numbers in Dkk3−/− recipients. Lack of environmental DKK3 did not lead to increased numbers of B1 cells in DKK3 recipients, as observed in the steady state Dkk3−/− mice (Supplemental Fig. 2C). We found mainly cells expressing higher B220 levels and lower CD5 levels, representing rather B1b cells, than B1a cells, which would normally present the major B cell population of the PerC in the steady state (compare Supplemental Fig. 2C with Fig. 3A). The self-renewal capacity of B1 cells is increased in the absence of DKK3. (A) B1 cells were purified from PerC of wt (CD45.1) and Dkk3−/− (CD45.2) mice, mixed at a ratio of 1:1, and transferred to either wt.Rag2−/− or Dkk3−/− Rag2−/− mice. After 4 wk, B1 cell numbers were determined in spleen and PerC by FACS. FACS blots show the gating strategy starting from a leukocyte gate and the B1 cell phenotype. In the diagrams on the right, one dot represents cell numbers of one mouse. Mean is indicated for each group. Summary data from two independent experiments. (B) B cell proliferation in mice fed with BrdU, analyzed by gating of the appropriate population from the spleen and PerC (as demonstrated in Fig. 1) and subsequent determination of BrdU+ cells. Summary data of three independent experiments are shown. Mean and SEM is indicated for each group (n = 8). (C) B1 cells were purified from PerC and B2 cells from spleen as control cells and cultured 8 d without any stimuli. Apoptosis was determined by sub-G1 apoptosis assay, as shown exemplarily for day 5. Summary data of three independent experiments are shown. Mean and SEM is indicated for each group (n = 9). Groups were compared using Student t test. *p < 0.05, **p < 0.005, ***p < 0.0005. ns, not significant. B1 cells were increased in Dkk3−/− mice in the steady state. This observation is not recognizably based on an altered B1 cell development, as numbers of B1 cells were unchanged in neonatal as well as in 2- and 4-wk-old Dkk3−/− mice and in the BM at all analyzed time points (Fig. 2A, 2B, Supplemental Fig. 1). Furthermore, transfer of BM cells to Rag2−/− mice did not give rise to an increased B1 cell population in Dkk3−/− recipients (Supplemental Fig. 2C). Alternatively, the increased number of Dkk3−/− host B1 cells could be explained by a stronger self-maintenance program of the natural B1 cell population. To address this point, we transferred purified mature B1 cells from the peritoneal cavity into Rag2−/− mice, which were either wt or Dkk3−/−. Analogous to the BM chimera experiment, we used a 1:1 mixture of wt (CD45.1) and Dkk3−/− (CD45.2) B1 cells. After 4 wk, B1 cells were analyzed in recipient mice. B1 cells of Dkk3−/− origin (CD45.2) exceeded the wt (CD45.1) B1 cells in all recipient mice (Fig. 3A). Hence, the self-renewal program is increased in Dkk3−/− B1 cells. In addition, the number of B1 cells in Dkk3−/− recipients was higher than in wt recipients (Fig. 3A). Therefore, environmental DKK3 is also of importance for the self-renewal program of B1 cells. However, in competition, B1 cells from Dkk3−/− mice exhibit a stronger self-maintenance capacity than B1 cells isolated from wt mice independent of environmental Dkk3. The self-renewal process consists of proliferation and survival. To investigate these two processes, we fed wt and Dkk3−/− mice with drinking water containing BrdU. After 9 d, BrdU incorporation was similar in the different B1 cell populations in wt and Dkk3−/− mice in the PerC. 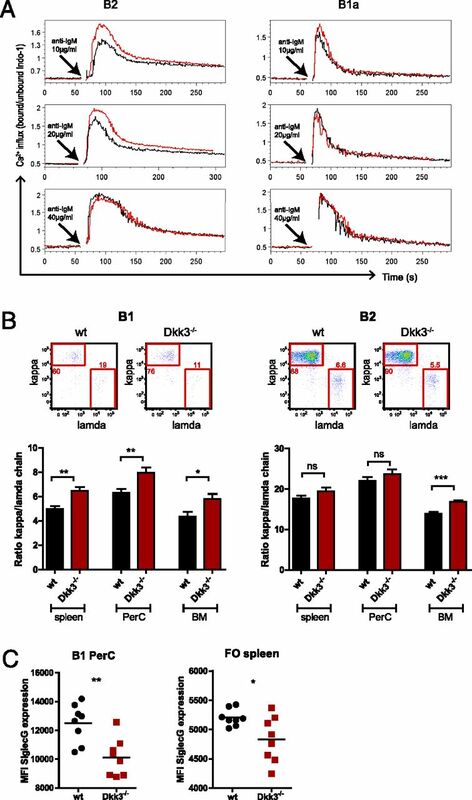 However, in the spleen, in which BrdU incorporation of B1 cells was in general higher than in the PerC, we found an increased BrdU incorporation, indicating increased proliferation, of B1 cells in Dkk3−/− mice (Fig. 3B). To analyze the survival capacity, B1 cells were purified from PerC of wt and Dkk3−/− mice and cultured without any stimuli for 8 d. Apoptosis was assessed at different time points by sub-G1 analysis. In contrast to B2 control cells, B1 cells from Dkk3−/− mice had a clearly reduced apoptosis rate compared with wt cells (Fig. 3C). Thus, Dkk3−/− B1 cells exhibit both an increased proliferation and survival capacity, which lead to higher numbers of B1 cells in Dkk3−/− mice. It has been shown that altered BCR signaling strength can lead to differences in B cell composition and numbers (12). Therefore, we addressed the question as to whether BCR signaling is affected by loss of DKK3 and compared calcium influx as part of the BCR signaling in B cells of wt and Dkk3−/− mice. We found that FO B cells of Dkk3−/− mice possess an increased calcium signaling upon BCR stimulation compared with wt controls, whereas B1 cells of Dkk3−/− mice showed only a slight, but reproducible tendency of increased BCR signaling at the lowest stimulation concentration (Fig. 4A). DKK3 may contribute to the control of BCR signaling. (A) Ca2+ responses of C57BL/6 (black line) and Dkk3−/− (red line) splenic B2 cells (gated as CD19+B220+CD23+CD43−) or PerC B1 cells (gated as CD19+B220lowCD23−CD43+CD5+) stimulated with F(ab′)2 anti-IgM (concentrations in histograms). Data represent typical results of one of three independent experiments. (B) FACS analysis of λ and κ usage of B2 (gated as CD19+B220+CD93−CD23+CD43−) and B1 cells (gated as CD19+B220lowCD93−CD23−CD43+) in different locations of C57BL/6 (wt) and Dkk3−/− mice. FACS blots are examples of B2 and B1 cells from the BM. (C) FACS analysis of SiglecG expression (mean fluorescence intensity [MFI]) by B1 in PerC (gated as CD19+B220lowCD23−CD43+CD5+) and FO B cells in spleen gated as CD19+B220+ CD21−CD43−CD23+) cells of C57BL/6 (wt) and Dkk3−/− mice. Summary data of three independent experiments. Mean ± SEM are shown. Groups were compared using Student t test. *p < 0.05, **p < 0.005, ***p < 0.0005. ns, not significant. To assess the molecular function of DKK3 in more detail, we performed a microarray gene analysis of purified B2 and B1 cells from wt and Dkk3−/− mice (data are accessible at Array Express [http://www.ebi.ac.uk/arrayexpress] under accession number E-MTAB-2850). The analysis of differentially expressed genes between wt and Dkk3−/− mice by Ingenuity Pathway Analysis (IPA) software pointed out genes responsible for the observed decrease in B2 cell—and increase in B1 cell numbers in absence of DKK3 (Supplemental Table I). The λ L chain of the BCR was identified by IPA as one of the genes downregulated in Dkk3−/− mice with possible connection to the observed phenotype (Supplemental Table I). Moreover, an increased BCR signaling, as shown above for Dkk3−/− B cells, could lead to altered B cell development, including an altered BCR editing and therewith an altered expression of the λ L chain (32, 33). Therefore, we analyzed whether the ratio of κ to λ L chain-expressing B cells is changed in Dkk3−/− mice on the protein level by FACS. We found that Dkk3−/− mice exhibit a lower number of λ-expressing B1 and B2 B cells in different locations (Fig. 4B). SiglecG was another downregulated gene in Dkk3−/− mice identified by IPA that may contribute to the observed phenotype. SiglecG is expressed highly on B1 cells and was shown to be a regulatory protein controlling calcium signaling and inhibiting the expansion of the B1 cell population (31). To confirm that SiglecG is downregulated also on the protein level in B cells of Dkk3−/− mice, B1 and B2 cells were analyzed by FACS for the expression of this molecule. We found a significant dowregulation of SiglecG in FO and B1 cells of Dkk3−/− mice (Fig. 4C). To investigate whether the altered B cell compartment in absence of DKK3 may lead to functional changes of B cell responses, we analyzed Ab and cytokine secretion of B cells. No difference in the Ab response between wt and Dkk3−/− mice was found upon immunization with TNP-Ficoll (Supplemental Fig. 3A), a thymus-independent type II Ag stimulating mainly MZ B cells (34, 35). TNP-BSA, a typical thymus-depending Ag (36), led to slightly increased levels of TNP-specific IgG1 Abs in Dkk3−/− mice (Fig. 5A). TNP-IgM levels were increased only in the steady state in Dkk3−/− mice, which reflects a part of the overall increased levels of IgM in Dkk3−/− mice, as already shown by Barrantes et al. (29). 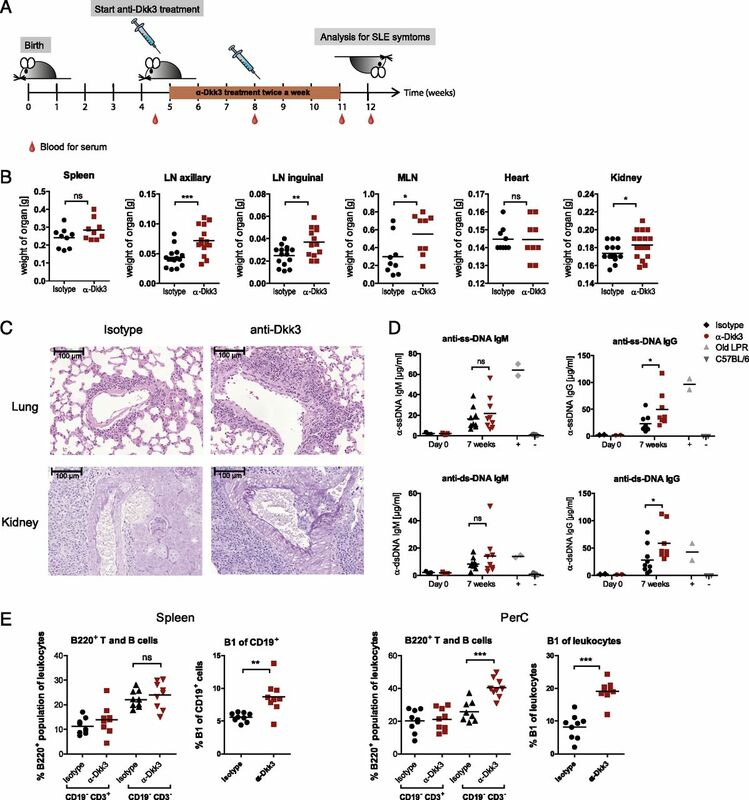 The most significant alteration of Ab levels upon immunization in the absence of DKK3 was observed when mice were immunized with thymus-independent Ags stimulating B1 cells (6, 37–39), such as LPS (Supplemental Fig. 3B) or phosphorylcholine–keyhole limpet hemocyanin (Fig. 6B). DKK3-deficient mice show increased Ab secretion and IL-10 secretion. (A) C57BL/6 (wt) and Dkk3−/− mice were immunized with TNP-BSA in CFA on day 0. Serum was analyzed by ELISA for TNP-BSA–specific Ab levels of IgM and IgG1. Data are pooled from three independent experiments, and one dot represents the Ab levels of one mouse. Horizontal bars represent the mean for each group. (B) C57BL/6 (wt) and Dkk3−/− mice were immunized s.c. with phosphorylcholine–keyhole limpet hemocyanin (PC-KLH) in CFA on day 0. Serum was analyzed by ELISA for phosphorylcholine-specific Ab levels of IgM and IgG. Data are pooled from two independent experiments, and one dot represents the Ab levels of one mouse. (C) PerC cells of C57BL/6 (wt) and Dkk3−/− mice were isolated and stimulated with 10 μg/ml LPS, 500 μg/ml ionomycin, and 5 ng/ml PMA in the presence of monesin for 6 h. Cells were stained for cell surface markers and intracellular IL-10. Dot blots show gated CD19+ lymphocytes comparing unstimulated and stimulated C57BL/6 (wt) and Dkk3−/− cells. B1 cells are B220low, B2 cell B220+. Summary data of the frequency of unstimulated (−) and stimulated (+) IL-10–secreting B cells within the pregated B1 or B2 population of PerC cells are shown on the right. Results show one of two independent experiments (n = 3). Groups were compared using Student t test. *p < 0.05, **p < 0.005, ***p < 0.0005. ns, not significant. DKK3 blockage leads to more severe symptoms of SLE in autoimmune MRL/LPR mice. (A) Experimental setup for anti-DKK3 Ab treatment of MRL/LPR mice. MRL/LPR mice were treated with anti-DKK3 Ab (n = 12) or isotype control Ab (n = 13) for 6 wk. At an age of 12 wk, mice were analyzed for symptoms of SLE (B–E). Blood was collected several times for serum extraction. (B) Weight of spleen, axillary LN, inguinal LN, mesenteric lymph nodes (MLN), heart, and kidney was determined. Summary data of three independent experiments are shown. One dot represents weight of one organ. (C) Mice were sacrificed, and tissues were collected in formalin. Paraffin tissue sections of lung were stained with H&E, and paraffin tissue sections of kidney were stained with periodic acid–Schiff stain. Original magnification ×20. Representative pictures of each group are depicted. Kidneys of Dkk3−/− mice show focal arteritis and strong inflammatory infiltrates predominantly in the perivascular space. In lungs of Dkk3−/− mice, pronounced perivascular inflammatory infiltrates of mainly mononuclear cells were observed. (D) Concentration of anti-ssDNA–specific IgM and IgG as well as anti-dsDNA–specific IgM and IgG Abs was determined in sera taken at the start of treatment (Day 0) and 1 wk after treatment was finished (7 wk) by ELISA. Serum of 4- to 5-mo-old MRL/LPR mice and 2-mo-old C57BL/6 mice served as positive (+) and negative (−) controls. One dot represents Ab concentration in serum of one mouse. (E) Cells of spleen and PerC were stained for different T and B cell markers by FACS. Left panels show B220+ T (CD19−CD3+) and B (CD19+CD3−) cells. Right panels show analysis of B1 cells in the different lymphatic sites. One dot represents cell numbers of one mouse. Summary data of three independent experiments are presented. Groups were compared using Student t test. *p < 0.05, **p < 0.005, ***p < 0.0005. ns, not significant. To analyze whether cytokine secretion is altered in the absence of DKK3, we purified B cells from spleen and PerC and stimulated them in vitro. Cytokine secretion was measured 24 h later by cytometric bead array and/or ELISA. From the analyzed cytokines (IL-6, TNF-α, IFN-γ, IL-4, and IL-10), only IL-10 secretion was changed significantly (data not shown). As B1 cells have been shown to secrete large amounts of IL-10 (40), we analyzed IL-10 secretion on a single-cell level by FACS. Indeed, only the B1 cell population was able to secrete high levels of IL-10, but not the B2 population. Nevertheless, the increased IL-10 level observed in Dkk3−/− mice was not exclusively due to the increased number of B1 cells. In addition, a higher proportion of the B1 cell population secreted IL-10 in Dkk3−/− mice (Fig. 5C). The different changes in B cell subset distribution and function in Dkk3−/− mice enticed us to investigate whether autoimmunity caused by B cells would be affected in the absence of DKK3. MRL/LPR mice, which present a mouse model of the human disease SLE, were treated 6 wk with an anti-DKK3 Ab with neutralizing activity, as demonstrated previously (28), or isotype control, as depicted in Fig. 6A. MRL/LPR mice suffer generally from lymphadenopathy. At the time of analysis, all LN of anti-DKK3–treated mice were even more increased than LN of isotype control-treated mice (Fig. 6B). The kidney, which is the organ typically inflamed in MRL/LPR mice, also revealed increased weight in the anti-DKK3–treated mice, indicating a higher degree of inflammation. Microscopic analysis confirmed that indeed increased numbers of mononuclear cells infiltrated the kidney and also the lung (Fig. 6C). In both organs, infiltration was observed predominantly in the perivascular space. Analyzing autoantibody levels, such as anti-DNA Abs, typically observed in SLE patients, we found increased amounts of IgG anti-ssDNA and anti-dsDNA Abs in anti-DKK3–treated mice (Fig. 6D). Similarly to DKK3-deficient C57BL/6 mice, we found an increased population of B1 cells in anti-DKK3–treated MRL/LPR mice. 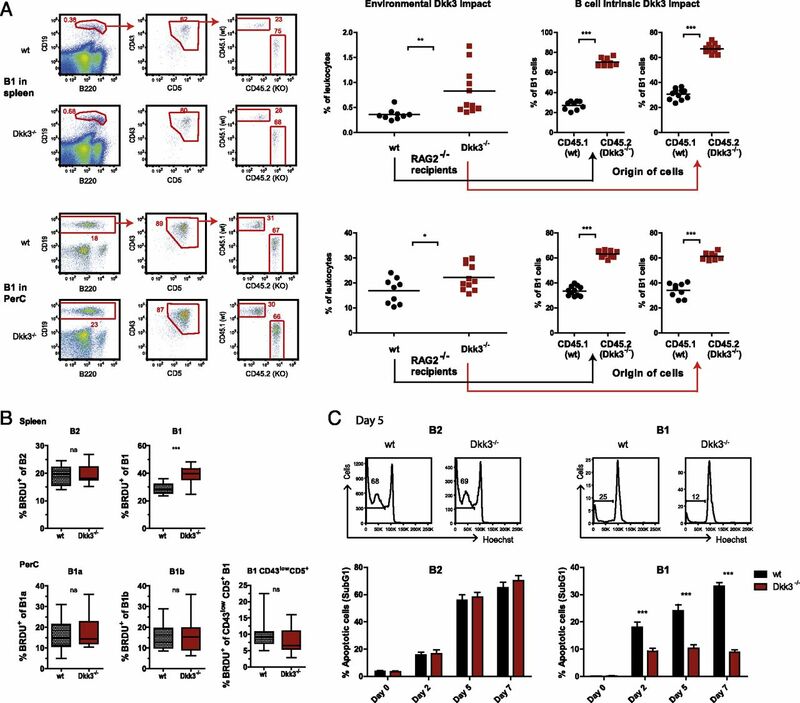 Our data establish a previously unrecognized function of DKK3 as a novel modulator of B cell fate and maintenance, thereby leading to changes in B cell responses. Loss of DKK3 function affected the following: 1) the development of B2 cells at the pre- and immature B cell stage; 2) B1 cell self-maintenance in the periphery, by increasing their survival and proliferation behavior; 3) Ab and cytokine production by B cells; and 4) B cell autoreactivity in a model of SLE. A detailed analysis of B cell subsets in different sites of the body and at different ages of mice revealed that B cell development is impaired in the absence of DKK3, starting directly after birth, leading to reduced FO B cell numbers in adult spleen of DKK3-deficient mice. The maturation step from the immature to the mature B cell did not seem to be impaired, as in younger mice, mature FO B cell numbers were equal in wt and Dkk3−/− mice. B cell numbers were reduced at the pre- and immature B cell step in the absence of DKK3. In these two steps, pre-BCR and BCR signals are crucial. The transiently expressed pre-BCR provides feedback to the cell about the success of H chain recombination and induces proliferation (41, 42). After recombination of the L chain, the entire BCR is expressed in immature B cells. In this step, B cells are first tested for reactivity to self-Ags (43). Because we observed a reduction of B cell numbers in DKK3-deficient mice at the time of BCR expression and no difference in B cell numbers in absence of BCR signaling in Dkk3−/−Rag2−/− mice, it may be possible that DKK3 regulates BCR signaling. This aspect will be further discussed below. Adoptive transfer experiments of BM progenitor cells confirmed that DKK3 is indeed necessary for the development of a normal B cell compartment. Not only environmental DKK3, but also DKK3 expressed by B cell progenitors controlled B cell development. Independent of the presence of DKK3 in the environment, BM progenitors from wt animals developed stronger into mature B cells than progenitor cells coming from DKK3-deficient hosts, in which the only cells expressing Dkk3 were B cell progenitor cells. Hence, Dkk3 expressed by B cell progenitors themselves is able to support B cell development. It has been shown that transfer of adult BM into immune-deficient mice resulted mainly in the occurrence of B2 and B1b cells, but not B1a cells (44). In some transgenic systems, the generation of B1a cells was possible. However, these cells differed from the natural B1a cell population, with an altered IgH chain repertoire containing N nucleotide insertions, and no expression of the VH11 gene family (45). We observed B1 cells complying more with the B1b than the B1a cell phenotype in BM recipients. Interestingly, the development of B1 cells in our experiments was similarly supported by environmental DKK3 as one of the B2 cells. In contrast, the maintenance of B1a cells in adoptive transfer experiments, as discussed below, was limited in the presence of DKK3. This is in line with recent findings showing that B1b cells are more similar to B2 cells than B1a cells in terms of development (46). B1 cell numbers were not altered in younger Dkk3−/− mice, but were significantly increased in adult mice lacking DKK3. The B1 cell population is self-renewing (44), and the spleen has been shown to be an important organ for B1 cell maintenance (47). Because we found increased proliferation in the spleen and decreased apoptosis of B1 cells of Dkk3−/− mice, we conclude that DKK3 limits the self-maintenance capacity of B1 cells. SiglecG has been shown to control the expansion of the B1 cell population (31). Therefore, the decreased expression of SiglecG in Dkk3−/− mice might contribute to the increase in B1 cell numbers. Another explanation may represent the increased secretion of the cytokine IL-10 in Dkk3−/− mice, as IL-10 has been demonstrated to act as a growth factor for the B1 cell population and contribute to their self-maintenance (48–51). Because we did not observe differences in B1 cell numbers in neonatal mice, 2 and 4 wk old, nor in the BM of Dkk3−/− mice, we suggest that B1 cell development may not be directly impaired by DKK3. However, it has been proposed that the selection process of MZ and B1 cells during development is similar, as these cells also exhibit similar functions (17, 34, 52). Because we found that MZ B cell development was affected by DKK3 in early phases of B cell development (in neonatal, 2- and 4-wk-old mice, but not in adult mice), we do not like to exclude that B1 cell development may also be changed in the absence of DKK3. The observation that B cell numbers were altered in Dkk3−/− mice only after recombination of the BCR genes raised the possibility that DKK3 may affect BCR signaling. This view is supported by three observations. First, BCR signaling and functional modulation of molecules affecting BCR signaling could impact on FO and B1 cell numbers (31, 53). We found increased BCR signaling in B cells of Dkk3−/− mice by assessing calcium influx. Second, SiglecG is inhibiting BCR-induced calcium signaling (31). Therefore, the observed lower expression of this molecule in B cells of Dkk3−/− mice may contribute to the increased calcium signaling. Third, increased BCR signaling leads to less receptor editing in B cells (33). Accordingly, we found lower numbers of λ-expressing B cells in Dkk3−/− mice. Taken together, these results strongly suggest that DKK3 might be a protein influencing BCR signaling. In addition to the λ-chain and SiglecG, EBF1 was found to be downregulated in absence of DKK3 by microarray gene analysis and determined by IPA to be responsible for the observed B cell phenotype of Dkk3−/− mice (Supplemental Table I). EBF1 has been shown to be crucial for B cell development (54). Furthermore, it was demonstrated to be required for B cell commitment, pro-B cell development, and subsequent transition to the pre-B cell stage (55). Lack of this molecule leads to loss of B cells at the pre-B cell step, which reflects our observations in Dkk3−/− mice (54). Whether or not DKK3 affects B cell development by regulating EBF1 expression requires further investigations. DKK3 is highly expressed in the fetus, including fetal liver (56, 57). This early DKK3 expression might regulate B1 cell development, as the fetal liver is one of the most important sites for B1 cell development (8). Furthermore, we found DKK3 expression in developing B cells themselves in the BM, but not in mature B cells, which implies the importance of DKK3 during B cell development. Our BM chimera experiments demonstrated that both intrinsic and environmental non-B cell–derived DKK3 could contribute to B cell development. DKK3 expression in mature B cells was not detectable. However, adoptive B1 cell transfer experiments showed that the observed phenotype was dependent on the origin of the transferred B cells, isolated either from DKK3-sufficient or -deficient mice, as well as on environmental DKK3. This raises two options. Either the DKK3 expression observed during development may change the genetic program of the B cell long-lastingly, or DKK3 in the environment is taken up by B cells and alters their behavior over a longer period. Both possibilities might reflect an imprinting mechanism. Also, mature B cells not expressing DKK3 possess an altered B cell function, with increased Ab responses as well as increased secretion of the cytokine IL-10. Furthermore, treatment of MRL/LPR mice with neutralizing DKK3 Abs lead to aggravated disease, demonstrating that environmental DKK3 is able to act on B cells. It has been reported that DKK3a binds to integrin α6b in zebrafish (58). However, to date, no surface receptor for DKK3 could be identified in mice or humans. Kataoka et al. (59) demonstrated that recombinant human DKK3 is internalized by induced pluripotent stem cell–derived embryoid bodies via endocytosis, which could represent a mechanism also used by B cells and their progenitors. Because we demonstrated that DKK3 expression by B cell progenitors alone is sufficient to support their development, DKK3 might also act in an autocrine manner on B cells. Secreted DKK3 may be taken up and interact with intracellular signaling molecules. For example, DKK3 was shown to interact with β-TrCP in the cytoplasm, thereby acting as a negative regulator of Wnt signaling (60). Wnt signaling, in turn, has been connected to B cell development in different studies (61–63). Further investigations are necessary to reveal the exact molecular mechanisms and possible binding partners of DKK3 function. IgM levels in serum were increased in Dkk3−/− mice in the steady state. On one hand, these higher levels of B1-secreted natural IgM may protect Dkk3−/− mice against different bacterial and viral infections (64, 65). In contrast, Dkk3−/− mice might be more prone to autoimmunity. In the C57BL/6 background, no signs of spontaneous autoimmunity were observed. However, in the MRL/LPR background, a higher level of autoimmunity was detected in mice treated with the neutralizing DKK3 Ab. These mice showed an increase in B1 cell numbers similar to C57BL/6 mice deficient for DKK3, correlating with increased disease parameters. Also, in other studies, increased B1 cell numbers were associated with increased autoimmunity (37, 66–69). However, whether this correlation is causal or rather compensatory for the autoimmune disease must be resolved, as B1 cells were also described to have regulatory potential as part of the described regulatory B cells (70–72). The accelerated disease in anti-DKK3–treated mice might be due to a stronger BCR signaling and a therewith connected higher potential to react pathogenically. In summary, we identified DKK3 as a novel regulator in determining B cell fate and function. Other DKK family members are necessary during embryonic development (19). Hence, the involvement of DKK3 in B cell development fits well into the capacity of the DKK family to regulate developmental processes. Because B cell function can be influenced by environmental DKK3, further exploration of the molecular mechanisms will help to progress to therapeutically relevant strategies. We thank the German Cancer Research Center FACS Core Facility, especially Dr. Steffen Schmitt, for expert LSRII assistance and help with the setup of Ca2+ signaling measurements. We thank the German Cancer Research Center Genomics and Proteomics Core Facility, especially Dr. Melanie Bewerunge-Hudler and Matthias Schick, for expert microarray analysis and help with data analysis. We thank Prof. Dr. Fritz Melchers, Prof. Dr. Günter Hämmerling, and Dr. Thilo Oelert for critical discussion. This work was supported by a stipend from Boehringer Ingelheim Fonds and Deutsche Forschungsgemeinschaft Grant SFB 938. The sequences presented in Supplemental Table I have been submitted to Array Express (http://www.ebi.ac.uk/arrayexpress) under accession number E-MTAB-2850.
. 1992. Layered evolution in the immune system: a model for the ontogeny and development of multiple lymphocyte lineages. Ann. N. Y. Acad. Sci. 651: 1–9.
. 1993. Para-aortic splanchnopleura from early mouse embryos contains B1a cell progenitors. Nature 364: 67–70.
. 1999. Innate and acquired humoral immunities to influenza virus are mediated by distinct arms of the immune system. Proc. Natl. Acad. Sci. USA 96: 2250–2255.
. 2007. Division and differentiation of natural antibody-producing cells in mouse spleen. Proc. Natl. Acad. Sci. USA 104: 4542–4546.
. 2012. B-1 B cell development in the fetus and adult. Immunity 36: 13–21.
. 2007. Fetal B-cell lymphopoiesis and the emergence of B-1-cell potential. Nat. Rev. Immunol. 7: 213–219. 2000. B-1 cells: the lineage question revisited. Immunol. Rev. 175: 9–22.
. 1979. Ontogeny of terminal deoxynucleotidyl transferase-positive cells in lymphohemopoietic tissues of rat and mouse. J. Immunol. 123: 1347–1352.
. 1993. The regulated expression of B lineage associated genes during B cell differentiation in bone marrow and fetal liver. J. Exp. Med. 178: 951–960.
. 2004. B cell receptor signal strength determines B cell fate. Nat. Immunol. 5: 317–327.
. 1999. B cell antigen receptor specificity and surface density together determine B-1 versus B-2 cell development. J. Exp. Med. 190: 471–477.
. 1994. Development of B-1 cells: segregation of phosphatidyl choline-specific B cells to the B-1 population occurs after immunoglobulin gene expression. J. Exp. Med. 179: 1585–1595.
. 2000. A VH11V kappa 9 B cell antigen receptor drives generation of CD5+ B cells both in vivo and in vitro. J. Immunol. 164: 4586–4593.
. 1994. Distinctive developmental origins and specificities of murine CD5+ B cells. Immunol. Rev. 137: 91–118.
. 2000. B-cell subsets and the mature preimmune repertoire: marginal zone and B1 B cells as part of a “natural immune memory.” Immunol. Rev. 175: 70–79.
. 2006. Identification of a B-1 B cell-specified progenitor. Nat. Immunol. 7: 293–301. 2006. Function and biological roles of the Dickkopf family of Wnt modulators. Oncogene 25: 7469–7481.
. 2010. Analysis of Dickkopf3 interactions with Wnt signaling receptors. Growth Factors 28: 232–242.
. 1999. Functional and structural diversity of the human Dickkopf gene family. Gene 238: 301–313.
. 1998. Dickkopf-1 is a member of a new family of secreted proteins and functions in head induction. Nature 391: 357–362.
. 2008. Downregulation of Dkk3 activates beta-catenin/TCF-4 signaling in lung cancer. Carcinogenesis 29: 84–92.
. 2004. Dickkopf 3 inhibits invasion and motility of Saos-2 osteosarcoma cells by modulating the Wnt-beta-catenin pathway. Cancer Res. 64: 2734–2739.
. 2003. Functional characterization of WNT7A signaling in PC12 cells: interaction with A FZD5 × LRP6 receptor complex and modulation by Dickkopf proteins. J. Biol. Chem. 278: 37024–37031.
. 2007. Dickkopf-3 is expressed in a subset of adult human pancreatic beta cells. Histochem. Cell Biol. 127: 513–521.
. 2009. Dkk-3 is elevated in CSF and plasma of Alzheimer’s disease patients. J. Neurochem. 110: 653–661.
. 2012. Dickkopf-3, an immune modulator in peripheral CD8 T-cell tolerance. Proc. Natl. Acad. Sci. USA 109: 1631–1636.
. 2006. Generation and characterization of dickkopf3 mutant mice. Mol. Cell. Biol. 26: 2317–2326.
. 2001. Characterization of a novel EGFP reporter mouse to monitor Cre recombination as demonstrated by a Tie2 Cre mouse line. Genesis 30: 36–44.
. 2007. Siglec-G is a B1 cell-inhibitory receptor that controls expansion and calcium signaling of the B1 cell population. Nat. Immunol. 8: 695–704.
. 2014. The selection of mature B cells is critically dependent on the expression level of the co-receptor CD19. Immunol. Lett. 160: 113–119.
. 2011. Tonic BCR signaling represses receptor editing via Raf- and calcium-dependent signaling pathways. Immunol. Lett. 135: 74–77.
. 2002. Marginal-zone B cells. Nat. Rev. Immunol. 2: 323–335.
. 2002. Origins and functions of B-1 cells with notes on the role of CD5. Annu. Rev. Immunol. 20: 253–300. 1992. Polyclonal activation of B lymphocytes by lipopolysaccharide requires macrophage-derived interleukin-1. Immunology 77: 477–482.
. 1992. Ly-1 B (B-1) cells are the main source of B cell-derived interleukin 10. Eur. J. Immunol. 22: 711–717.
. 1996. The surrogate light chain in mouse B-cell development. Int. Rev. Immunol. 13: 341–356.
. 1996. Surrogate light chain in B cell development. Adv. Immunol. 63: 1–41.
. 2000. B-cell-receptor-dependent positive and negative selection in immature B cells. Curr. Top. Microbiol. Immunol. 245: 57–71.
. 1992. Adoptive transfer of murine B-cell lineages. Ann. N. Y. Acad. Sci. 651: 168–169.
. 2009. Induction of B-cell development in adult mice reveals the ability of bone marrow to produce B-1a cells. Blood 114: 4960–4967.
. 2012. Distinct B-cell lineage commitment distinguishes adult bone marrow hematopoietic stem cells. Proc Natl Acad Sci U S A. 109: 5394–5398.
. 2002. B-1a B cells that link the innate and adaptive immune responses are lacking in the absence of the spleen. J. Exp. Med. 195: 771–780.
. 1995. Administration of interleukin-5 or -10 activates peritoneal B-1 cells and induces autoimmune hemolytic anemia in anti-erythrocyte autoantibody-transgenic mice. Eur. J. Immunol. 25: 3047–3052.
. 1992. IL-10 production by CD5 B cells. Ann. N. Y. Acad. Sci. 651: 182–199.
. 1996. Requirement for increased IL-10 in the development of B-1 lymphoproliferative disease in a murine model of CLL. J. Clin. Invest. 98: 1788–1793.
. 2001. Cell cycle effects of IL-10 on malignant B-1 cells. Genes Immun. 2: 239–247.
. 2001. Autoreactivity by design: innate B and T lymphocytes. Nat. Rev. Immunol. 1: 177–186.
. 2001. A CD19-dependent signaling pathway regulates autoimmunity in Lyn-deficient mice. J. Immunol. 167: 2469–2478.
. 1995. Failure of B-cell differentiation in mice lacking the transcription factor EBF. Nature 376: 263–267.
. 2012. Essential role of EBF1 in the generation and function of distinct mature B cell types. J. Exp. Med. 209: 775–792.
. 2008. Differentially expressed genes in a porcine adult hepatic stem-like cell line and their expression in developing and regenerating liver. Lab. Invest. 88: 132–143.
. 2011. Distinct expression patterns of dickkopf genes during late embryonic development of Danio rerio. Gene Expr. Patterns 11: 491–500.
. 2012. Zebrafish Dkk3a protein regulates the activity of myf5 promoter through interaction with membrane receptor integrin α6b. J. Biol. Chem. 287: 40031–40042.
. 2010. Internalization of REIC/Dkk-3 protein by induced pluripotent stem cell-derived embryoid bodies and extra-embryonic tissues. Int. J. Mol. Med. 26: 853–859.
. 2009. Dkk3, downregulated in cervical cancer, functions as a negative regulator of beta-catenin. Int. J. Cancer 124: 287–297.
. 1999. Control of lymphocyte differentiation by the LEF-1/TCF family of transcription factors. Cold Spring Harb. Symp. Quant. Biol. 64: 133–140.
. 2005. Frizzled 9 knock-out mice have abnormal B-cell development. Blood 105: 2487–2494.
. 2005. Constitutively active beta-catenin confers multilineage differentiation potential on lymphoid and myeloid progenitors. Immunity 23: 599–609.
. 1999. Control of early viral and bacterial distribution and disease by natural antibodies. Science 286: 2156–2159.
. 2012. Protective roles of natural IgM antibodies. Front. Immunol. 3: 66.
. 1988. B cells expressing CD5 are increased in Sjögren’s syndrome. Arthritis Rheum. 31: 642–647.
. 1990. The relationship between CD5-expressing B lymphocytes and serologic abnormalities in rheumatoid arthritis patients and their relatives. Arthritis Rheum. 33: 339–348.
. 1995. B-1 cells and autoimmunity. Ann. N. Y. Acad. Sci. 764: 402–409.
. 2013. IL-10-producing regulatory B cells (B10 cells) in autoimmune disease. Arthritis Res. Ther. 15(Suppl. 1): S1.
. 2003. Pneumococcal vaccination decreases atherosclerotic lesion formation: molecular mimicry between Streptococcus pneumoniae and oxidized LDL. Nat. Med. 9: 736–743.
. 2003. Autoimmunity: busting the atherosclerotic plaque. Nat. Med. 9: 641–642.